High school was a fun time for many people. But would you actually want to go back and relive it? Maybe, if you could star on a school’s basketball team! This happens occasionally. 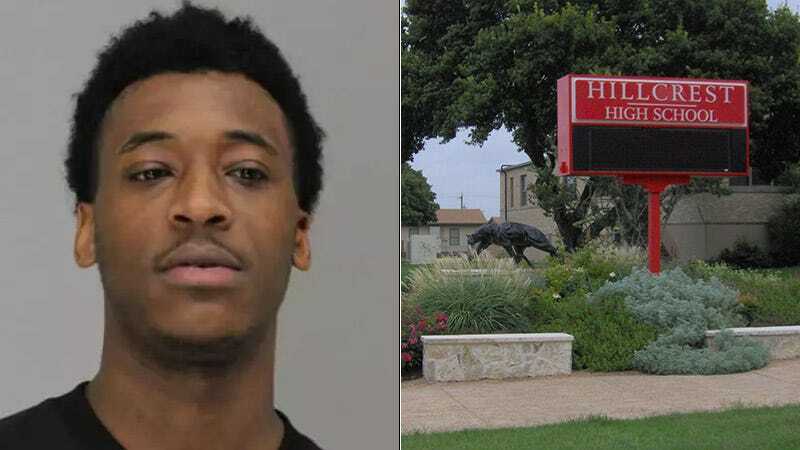 And it apparently happened again this school year, as police in Texas say a 25-year-old man posed as a Hurricane Harvey evacuee in order to attend and play basketball at Hillcrest High School in Dallas. Police say Sidney Bouvier Gilstrap-Portley posed as a 17-year-old and played basketball for the Panthers this season. He was arrested Friday night and is charged with tampering with government records. Most troublingly, The Dallas Morning News reports he dated a 14-year-old this school year. He also has a kid. He’d previously played basketball at North Mesquite High School and Dallas Christian College. As one might expect from a 25-year-old playing against teens, he starred for Hillcrest this season; coaches voted him offensive player of the year in his district classification. “He was an average player and a good kid, I’m surprised,” Randall said. Makes sense. After all, Hillcrest only went 11-10 this year with a 25-year-old on the roster.